CCS Educational's Calculator Charging Station. CCS has invented the Calculator Charging Station. It charges your alkaline rechargeables while in the calculator. With a set of new Schoolcell Rechargeables, you will not need to change batteries for up to 5 years or longer. We how have two types of Stations. One for the 83 series and one for the 84 series of calculators. The Calculator Charging Schedule comes with the Schoolcells. If you would like some for free, let us know when you buy the Station. You need one for each calculator you have. from 3.00 ea. Check this link to find correct Code. When you order 3 or more Class Set Package CSP 83, 83+ or 84, you get the Calculator Conversion Package, CCP, FREE! Once the Calculator Charging Kit, is installed on the calculator, that takes a half minute for each, you simply snap the calculator into the Charging Station and it starts charging. When the Green light goes out, its done. No messing with batteries! To get more life out of a set of batteries you should do two things. Charge batteries as a set and charge often. With the Calculator Charging Station, you can easily do both. Using the charging station with a locked battery door and following the charging schedule, the warranty on the Schoolcells is extended from 3 to 5 years. The Schoolcells come with a Charging Schedule. It attaches to the calculator door and allows you to keep track of every charge for each calculator. The schedule has space for 6 years of charging. The length of time to charge a set of batteries, is a function on how much the calculator was used. As you will be charging more often, it will probably take less than an hour per calculator. The XL batteries, because of the higher drain of the 84+, may take longer. 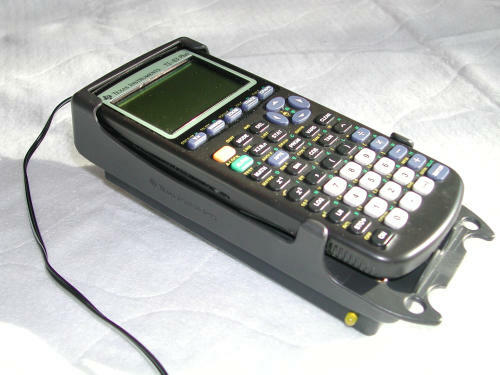 Calculator Charging Station and KitTM is a trade mark of © CCS Educational Inc 2003. Patent Pending.